I am so glad that Kathryn opened her doors and shared her family with readers. I enjoyed getting to know the Huling family, not just Michael. Everyone of them was special in their own way. They let Michael into their home and hearts. I know Michael got a place in my heart as well. The Huling family and Michael show that people with Down Syndrome have feelings too. They just want to be normal like everyone else. I could understand Michael not liking people staring at him. I know I don't like it either. So I can not imagine what people like Michael go through. I retract my comment, I do now have a good idea of what Michael goes through after reading this book. The family photos were fun. I noticed that Michael had a great smile in the pictures. The rest of the family looked happy as well. I have to say that this is the type of book I want to read when I think of memoirs/nonfiction stories about real people. Because I felt like the book was not over edited, I really got to know everyone and this helped me to really enjoy this book. Also, I have to agree with another reader's comment that this book gives a good insight into someone living with this condition from birth to adulthood. Life with a Superhero is a super, good read. A huge thank-you to Mrs. Kathryn U Hulings for opening up your heart and writing about your wonderful life with Michael. What an incredible journey, not to mention uplifting!!! I read a few true stories of Down Syndrome but they only go up to a certain age so this was a treat to read about a child from birth to adulthood,trying to make a space in the world. As a child and now an adult living with mild CP, I could relate to some of the things that were discussed in the book about inclusion and trying to face the world as a person living with a disability. This made me realize that I am not alone. So I thank the author again and I am proud to give Life With a Superhero 5 stars, and would be the first to recommend it to people who are struggling with a disability or are struggling because someone they love has a disability. This book is at times laugh out loud funny, heartwarming, thought-provoking and uplifting. Setting aside Kathryn's potty-mouth, I loved this book! There is something so wonderful about people with Trisomy 21 and the love and exuberance they have for life. I learned things about love, inclusion, motherhood and joy from reading this. Although I know Kathryn and her family and work at Michael's junior high (now a middle school), there is no reason someone unknown to their family can't absolutely enjoy reading this. In fact, getting to know their family through this book would be a treat. I recommend it to anyone who loves a funny, heartwarming story about a normal family in occasionally extraordinary circumstances. Kathryn is a phenomenal author who puts truth, life, and character into every word. 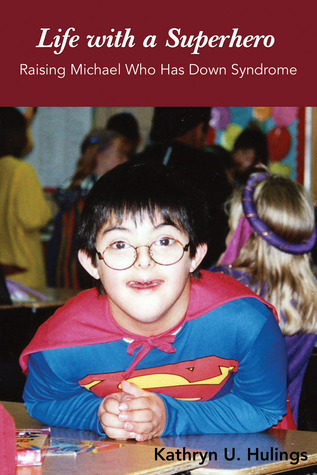 I fell in love with Michael, who has down syndrome, story after story. This book invites you into the Hulings home to experience the reality--the good, bad, and ugly--of raising a child with special needs.